This section is dedicated to key elements that do not fall under content or design but are still critical for an EHDI website to be functional and accessible. The mouse is the most common way for people without disabilities to interact with a website. Move the mouse, point and click to select a link or scroll down on a page. People with disabilities rely on assistive technology devices to interact with the web. The use of a keyboard as an input and control device is universally supported and operable by many people with disabilities. When all functionality of content can be operated via a keyboard or keyboard interface, the site can be accessed by those with no vision, motor disabilities, and those who must use alternate keyboards or input devices that act as keyboard emulators (such as speech input software or on-screen keyboards). To determine if a webpage is keyboard accessible, first determine what functionality is available to users on the page. It is important to consider functions performed using both the mouse and the keyboard together. Examples of functionality include the use of physical controls such as links, menus, buttons, checkboxes, radio buttons, and form fields, as well as the use of features like drag and drop, selecting text, resizing regions, or opening context menus. ENTER key to follow links. When inside forms, the arrow keys will allow you to select items within lists or radio buttons. Pay close attention to any interactive features, such as dynamic menus, drag-and-drop functions, or mouse rollover events. If the mouse rollovers are merely decorative (e.g. they create a “glow” effect), you needn’t take any extra steps. However, if the mouse rollovers reveal additional important information, ensure that this information can be accessed by the keyboard alone. Links that make sense out of context and function properly are critical for navigating and interacting with a website. Links can appear as text or images to open other web pages/sites, redirect viewers to another part of the page, or open a new application for a media file. These contextual link descriptions allow users to distinguish links and help them to understand where the link goes before they click it. Links do not make sense when non-informative link phrases such as: “click here,” “read more,” or “click for more detail” are used. The EHDI Website Resource Guide is provided by NCHAM. 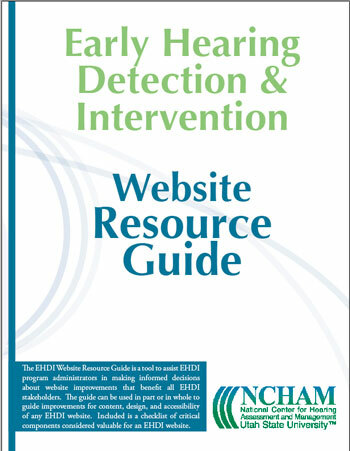 The EHDI Website Resource Guide [PDF] is provided by NCHAM. Links that use media icons should include the icon as part of their text description for the entire link. The alternative text for the icon should state the icon type. If the imaged is linked to a website, the alt text states EHDI Website Resource Guide. It is critical that all audiences understand information concerning hearing loss and newborn hearing screening. Parents, healthcare providers, interventionist, and EHDI want infants and toddlers with hearing loss to be identified as early as possible and provided with timely and appropriate audiological, educational, and medical intervention. To improve health literacy of EHDI website content it is important to be aware of target audiences. Things that affect the users’ comprehension of material is not limited to but includes culture, socioeconomic status, education level, and disabilities. Reading level of content is used to determine if the general audience should be able to understand the material provided on your website. Ways to improve the reading level on a web page is to simplify language, use illustrations, graphics, bullet points, tables, ect. At times it may be necessary to include additional resources or provide content that is written in another language to provide the same information to users. Since EHDI programs have a broad target audience it is suggested that content for families should be written for people with a lower secondary education (7-9 years of school). Information for healthcare providers can be written for people with a more advance education level (more than 12 years of school). Information about the EHDI process applies to all audiences and should be developed for people with a lower education level and have more detail available for people with a higher education level.